CHICAGO - April 4, 2017 - PRLog -- AKA Associates announces the release of a new coloring book in the Doodle Art Alley Books series. 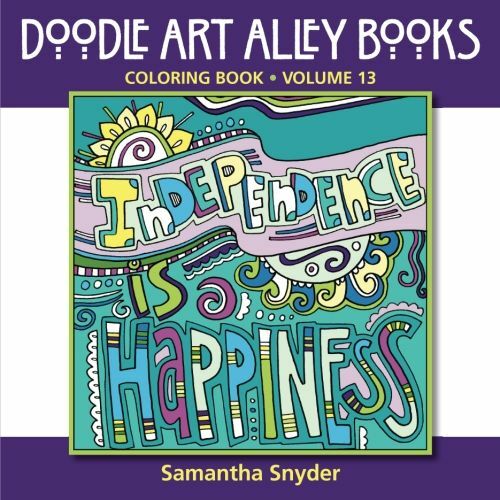 Independence Is Happiness: Coloring Book ($11.95; 148 pages; paper; ISBN: 978-0997102123) features 60 doodle designs of inspiring quotes from more than 30 amazing women including Susan B. Anthony, Jane Austen, Elizabeth Blackwell, Emily Dickinson, George Eliot, Helen Keller, Emma Lazarus, Eleanor Roosevelt, Harriet Beecher Stowe, Harriet Tubman, and more. The notable women featured in this book were activists, advocates, authors, humanitarians, lecturers, novelists, poets, pioneers, scientists, and more. The appendix shares brief profiles of these extraordinary trailblazers and wonderful women all. These doodle images provide plenty of enjoyment, inspiration and relaxation. "We are very honored to publish this inspirational doodle quote book that shares so many wonderful quotes from women and their words of wisdom—all in one place. In addition, we hope that the book provides coloring fun for everyone," says Kathleen Welton, Publisher of AKA Associates. The Mom's Choice Awards® has honored Doodle Art Alley Books with a Gold Recipient Seal of Approval, including Imagination Will Take You Everywhere, Mistakes Are Proof That You Are Trying, and Attitude is Everything as among the best in family-friendly media, products and services. AKA Associates is the publisher of the award-winning Doodle Art Alley Books series of coloring books for all ages. Samantha Snyder is the author and illustrator of books in the series as well as the founder of Doodle Art Alley. For more information visit: www.akabooks.com and www.doodle-art-alley.com. Doodle Art Alley Books are available at Amazon, Barnes & Noble, and at Independent Bookstores. Please contact info@akabooks.com for review copies of coloring books in the Doodle Art Alley Books series.